You can reserve materials kept in the Minato City Library system and pick them up at a desired Minato City Library branch or another associated facility. You can borrow books and other materials from the TEMPLE University Japan Campus Library and Tokyo University of Marine Science and Technology Library at any Minato City Library. Please come to the counter and fill out a Request Card to borrow from either of the universities. The Library will keep materials you have reserved for 7 business days, starting from the date we inform you of their availability for pickup. Please come and pick them up within this period. How many materials can a library member reserve at one time? If you have any overdue materials, you cannot borrow materials even during the holding period. Before coming to pick up materials, please make sure you have no overdue materials checked out. If you have any overdue materials checked out, you may not be able to reserve other materials. Materials divided into multiple volumes, book series, serial editions, and the like will be reserved individually, book by book. If you reserve a set of materials (e.g., first volume and second volume), we will prepare them in order. If a second volume becomes ready before the first, we will hold the second one until the first one becomes ready. If you want to pick up materials in any order, please let us know in advance. * We will not prepare comics in order. If a material you have reserved is unavailable because of an accident or a long delay in another member's return, we may contact you to cancel the reservation. You cannot specify the order of comics when reserving them. Comics you reserve will be provided as they become available. If you want to read a series of comic books in order, please make the necessary adjustments by yourself (e.g., reserve each volume on a different day in order). If we have only one copy of an item you reserve in the Minato City Library system and the item becomes unavailable because of an accident, misplacement, or long delay in a return, we may have to contact you to cancel the reservation. Please fill in a "Reservation Form For Books and Magazines" or "Reservation Form For Audio-Visual" and submit it to a service counter. You can download a Reservation/Request Card from here. You can print the card, fill it out, and bring it to a service counter. Download "Reservation Form For Books and Magazines"
Download "Reservation Form For Audio-Visual"
To view PDF files, you need to have Adobe Reader installed on your device. You can download Adobe Reader for free from the banner. 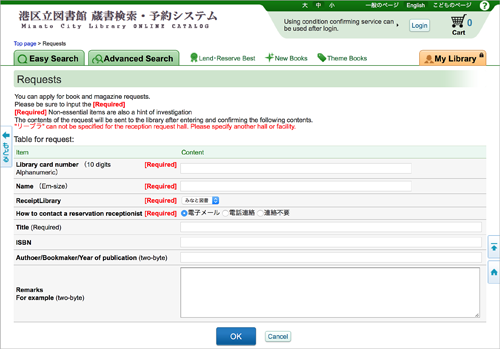 Each library branch has Search Terminals you can use to search and reserve materials from the Minato City Library collections. There are two types of Search Terminal: touch panel and keyboard. You can also search and reserve materials from the Minato City Library homepage. To use the reservation and other online services from Search Terminals, your PC, etc., log into My Library and click [Log-in] on the start page. If you have not yet registered a password, please go to "New log-in Password." The screenshots below show the buttons and information on your login status you will see at the top of the search screen and other online catalog screens. The buttons and messages shown above appear when you are logged out. To go to the log-in screen, click the [Login] button. Enter your user number (the 10-digit number on your Minato City Library Card) and log-in password to log in. If you see the buttons and messages shown below, you are already logged in. Click [Logout] to log out. Please make sure you are logged out whenever you leave a search terminal, your PC, etc. Search for the materials you want to reserve from the search screen. Please see "How to Search" (click to open another window) for more information. On the "Search result" screen or "Detailed information on search result" screen, click [Add to cart] or [Reservation]. Use the [Cart] to reserve multiple books at the same time. Click [Reservation] to reserve only the book you have found in your current search. Select a [Library Location] and [Contact means]. Select one of the three contact methods: [Mail], [Phone], or [Not Necessary]. If you select [Mail], you will need to register an e-mail address. Only Voice Library users can reserve cassettes and DAISY CDs. If you select the Takanawa Library Annex as your pickup location, you will need to complete a procedure to gain entry into the Takanawa Kids-to-Teens Hall. 4) Notice when your reserved materials become available for pickup. Once the material you reserved becomes available for pickup, we will contact you by the contact method you selected. If you select [Mail], you will receive an e-mail when the material becomes available for pickup. If you select [Phone], you will receive a call at the phone number you have registered. If you select [Not Necessary], you can check if the material is ready from My Library on a Search Terminal, your PC, etc. You can see the reserved materials on [My Library] > [Situation of reservation]. Check your reservation status from [Situation of reservation], [Limit of holding period], etc. [Reserved]: The material has been reserved for you. You can cancel or change the reservation. [Preparing]: Your reservation request is being processed. [Ready]: The material is ready. Please come and pick it up. Go to [My Library] > [Situation of reservation]. Click [Cancel] to cancel the reservation. To change the [Library] or [Contact info], select it from the pull-down menu and click [Modify reservation]. After receiving a notice of arrival, go to the library branch specified for pickup and complete the borrowing procedure. Please pick up the material within the holding period. Your reservation will be canceled after the holding period. Please be careful if you have selected [Not Necessary] as your Contact Method. Materials you request may have to be purchased or loaned out by other municipalities. In such a case, please note that we may be unable to fulfill your request or may need time to procure the material. If you have any overdue materials checked out, you may be unable to make new requests. If you try to reserve or request more than 10 books and magazines in total, your request will be declined. The library cannot guarantee the availability of requested materials displayed in the list of reserved materials. The order of reservations may be changed. In most cases, you will be unable to cancel book/magazine requests or change a pickup location. If you need to cancel or change, please contact the service counter at the pickup location as soon as you can. New books and recently issued magazines cannot be borrowed from other public libraries. Materials you borrow from libraries in other municipalities or the Tokyo Metropolitan Library must be returned to the circulation desk of the library you borrowed the material from. You will have to meet either of two conditions to borrow books and magazines from the National Diet Library, public libraries outside Tokyo, university libraries, and the like: 1) You must live in Minato City and hold a Minato City Library Card; 2) You must study or work in Minato City and hold a Minato City Library Card that has been issued for at least 3 months. When borrowing books and magazines from the National Diet Library, public libraries outside Tokyo, university libraries, and the like, you are responsible for the shipping charges. Books borrowed from the National Diet Library can only be read within the library premises. In no cases can they be removed from the library. Please note that we may be unable to provide you with a requested material (when, for example, the material is designated for in-library use only). Also note that we may need to call you, if necessary. Not-yet-published books whose release dates have not been announced. Not-yet-published books whose release dates are more than one month ahead. Magazines that have not yet been issued. When the information you provide for a material is unclear. Fill out and submit a "Reservation Form For Books and Magazines". 1) Go to [Search] to search the Library's online catalog for the material you want to request. Enter the name of the book, name of the author, keywords, and other details and click [Search]. 2) The list of search results appears. If no relevant material appears or you see a "No material found" message, you can request the material. Click the [Web Request Agreement] at the bottom of the screen to begin making the request. 3) Please read the conditions for making requests and related notes. If you agree to all of the conditions, click [Agree] to proceed to [Requests]. 4) Enter the request information in [Requests]. Please fill out all of the required fields, and as many of the non-required fields as possible (to facilitate the search). "Libra" can not be specified for the reception request hall. Please specify another hall or facility. 5) Click [Confirm] to see the information you have entered. If you want to correct or add any entry, click [Correct] to return to the previous screen. If everything is in order, click [Submit]. The request will be sent to the Library. 6) Once a request has been sent, there may be a time lag before the request is reflected in the system. Please note that the maxim number of reservations/requests is 10 in total per person. go to "Web Request Agreement"